After our Repair and enhancement of the Juzgado. 1994 -- the Fallon House and Peralta Adobe of the San Jose Historical Assn. Features: Diorama with accurate scale model of original Juzgado building but lacking in the human action necessary to tell the story. 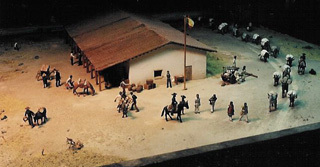 The Problem: The Historical Association of San Jose had a diorama, built in the 1960's and depicting the Juzgado, San Jose's first civic building built about 1850. The building was in the center of the settlement and served as the local courthouse, jail and storehouse for goods delivered to or shipped from San Jose by mule train. While the diorama was professionally built and of good workmanship, it had suffered some damage. 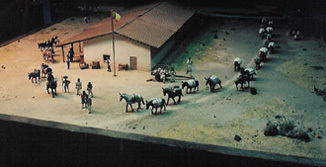 In addition, the story the diorama told was considered by the Association's historians to be inaccurate and incomplete, with only five figures and no dynamic action going on at what was the center of the settlement's commerce. Before our enhancement, not much activity at the center of San Jose. After our enhancement, the level of activity at the Juzgado is more like what our research suggested it should be. The Solution: Working with the South County Design Center which was responsible for the overall design of this museum's redo, we fixed the damage to the diorama. Then, based on our research, we developed a story for this diorama. 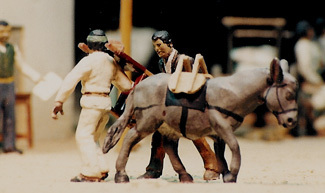 A mule train with a seemingly unending line of loaded pack mules extends to the back of the diorama on one side of the Juzgado. On the other side of the building stand the last animals of a recently arrived mule train. From one mule's back a scale model of an historic chair is being unloaded from the mule's carrying frame (see lower left). Both the chair and frame are modeled after real artifacts on display in the museum. In front of the building four native prisoners are being transferred from the jail portion of the building (see lower right). Two men are arguing outside the courtroom section of the building while waiting for the arrival of the Comisionado who served as mayor, judge and chief of police. 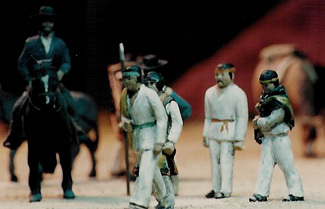 The addition of details such as these provide the needed story line for the diorama.